"The straightest passage is not always the simplest path to wellness. Nowhere is that assertion more obvious, and obviously more difficult than most imagine, regarding the attempt to quit cigarette smoking. It is an addiction as expensive in dollars as it is in lives, costing companies the chance to succeed and exacting the ultimate cost on workers and their families. If we are to not only win this battle but end this war, we must clear the air to see beyond an impenetrable cloud of carcinogens, tobacco, and smoke. We must find a harmless way for employees to taper their addiction to cigarettes. We must do so for reasons both monetary and moral, as we cannot afford to spend $300 billion every year on smoking-related illnesses. We cannot afford to lose 400,000 lives every year due to an addiction that makes the poor poorer and enriches advertisers, so they can attract new users and persuade current ones to maintain if not increase their addiction to cigarettes. We need to be more aware in general about how a smoke-free environment does not translate into a workforce of non-smokers. Or, people who look well are not necessarily physically well, not when they go outside every half-hour (or sooner) to light up and inhale a host of chemicals, so they can exhale clouds of secondhand smoke; so they can give life to these miniature smokestacks, while they shorten their own lives with every puff they take; so they can fill their lungs with tar and taint their blood with nicotine; so they can chew gum to freshen their breath and mist themselves with perfume to lessen the stench of tobacco, when they return to work and fidget at their desks. 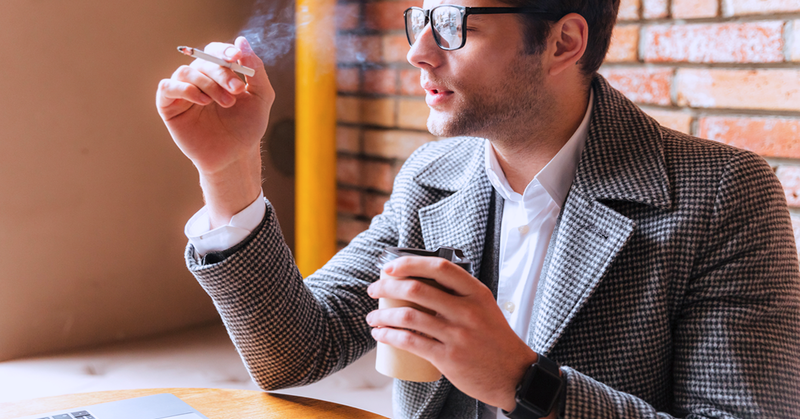 If corporate wellness is to be a cause rather than a catchphrase, we need to review the purported ways to quit smoking- because almost all of these methods do not work. The choice is not between the status quo, which is unsustainable and outlawing the tobacco industry which is unbelievable. On the contrary, I am no prohibitionist. I have no interest in criminalizing a habit or making criminals of habitual users of tobacco. I do, however, have an interest in saving lives. I have an interest in helping friends and members of my own family quit smoking cigarettes without them having to ingest one toxin- or anything toxic- as a substitute for what they already put into their bodies. If we can educate employees about harmless ways to free themselves of this addiction, all the better. Better still is the chance to free ourselves of the economic pain and emotional misery of an addiction that sickens too many and not-so-silently slaughters millions more because I can hear the coughing of the afflicted and I cannot help but weep at the sound of those who can barely breathe. Together, we can end this habit and renew the health of countless workers throughout America.